Here are some instructions for taking your tubers from storage (or purchase) to growing in your garden. In March, check on your stored tubers. Remove any that are rotted or have mildew. Separate the remaining tubers into those with eyes and those without eyes. 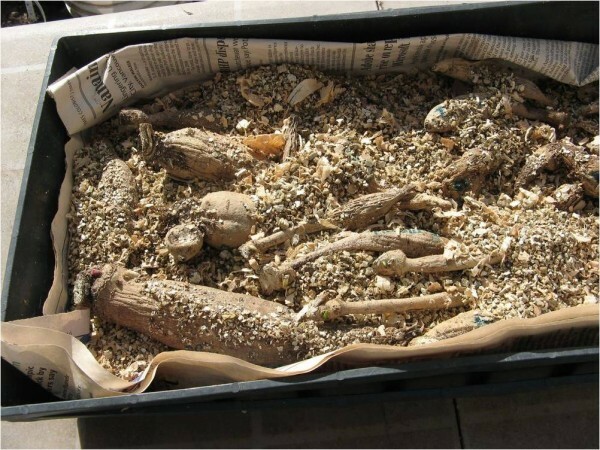 Place the tubers that do not have eyes in trays with soil, pet chips or some other medium spread over them. Place the trays in a warm room or greenhouse (at 18 to 20 degrees) and watch for them to “eye-up”. Place “eyed” tubers in pots with slightly moist potting soil (Sunshine #4 works well). Place the pots in a sunny protection location (inside by a window or in a greenhouse or cold frame). Avoid placing beside a hot window which could cause the tuber to dry out. Give the pots minimal water. Dahlias do not like a lot of water at this stage but at the same time don’t like to dry out. 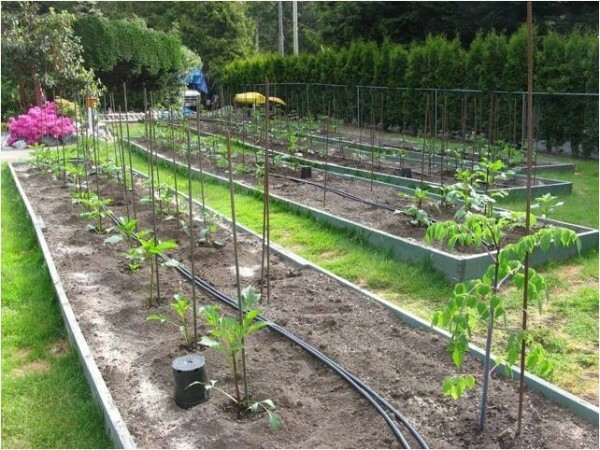 While your dahlias a getting started in their pots you can plan out your garden beds. Think about the height of your dahlias so that you do hide a short one behind a tall one. Recommended spacing for dahlias is 1m (3ft). 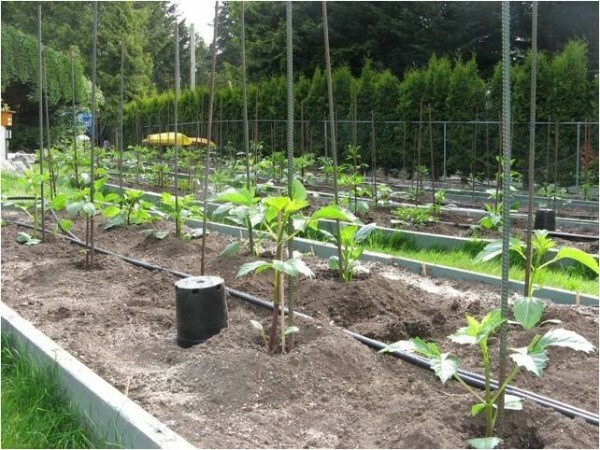 This provides space for air circulation and for pruning. 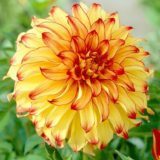 Your dahlias will need at least 6 hours of sun per day and soil with good drainage. This is also a time when you can get your soil tested for PH and nutrient levels so that you will know what amendments are will be needed for optimal performance. Planting can occur between mid April and mid May depending on weather and soil conditions. Give the soil a chance to warm up before planting and avoid planting in soggy soil. If there is a risk of frost you will need to cover you plants or just hold off on planting until frost season is over. Dig a hole 12″ deep and about shovel width wide. Drive a 4 to 5 ft stake into the edge of the hole. Place a small amount of fertilizer (such as 6-8-6) and bone meal into the hole. Cover the fertilizer with about 6″ of soil. 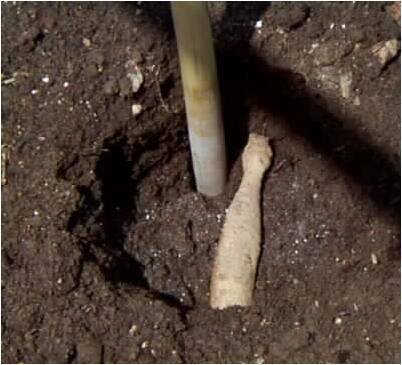 For tubers with eyes but not but stems and leaves place the tuber in the hole with the growing tip facing up and as close to the stake as possible. Leave a small indentations at the top of the hole for watering. For tubers that are already growing make the hole shallower and add your fertilizer. Place the plant so that the tuber is slightly below the soil surface. There are still two important things to do once your tuber is in the ground. First is to tie a tag with the dahlia name to your stake. Second is to apply your choice of slug and/or earwig deterrent. 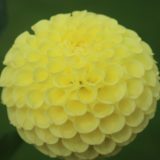 You don’t want your dahlia to be eaten before it has a chance to reward your efforts with some beautiful blooms.